Update: 542 in favour, 32 voting against, 13 abstentions. Nays & abstentions all from CDU, CSU, Left, apparently. See you in June. In about an hour, Germany’s parliament will have a debate on the extension of the bailout program for Greece that is scheduled to take all of a cool 90 minutes. It will be followed by a roll call vote. Although about 30 CDU/CSU dissidents including the deputy of the Christian Democrats’ parliamentary will vote against the government’s proposal or abstain, some North Korean-sized super majority is virtually guaranteed: The SPD and the Greens are almost unanimously in favour, and even the Left, who normally votes against the “neoliberal” EU stuff will support their comrades in Athens this time ’round. Then, it’s back to normal. Expect a similar procedure four months down the line, just in time for the next instalment of the Great Greek/European Drama Series (TM). In the meantime, don’t forget that V is for Varoufakis. … but then again, they don’t really care about the issue anyway. See my contribution on the LSE’s EUROPP blog for details, implications, T&C. Will Alexis Tsipras be Prime Minister of Greece? 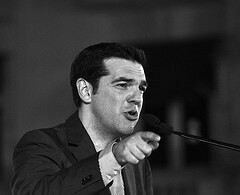 Everyone is angry/worried/excited/happy (delete as appropriate) about the prospect of Alexis Tsipras, the leader of the radical left-wing Syriza party, becoming Prime Minister of Greece, while the man himself has begun to treat the election as a mere formality. But is such an outcome even likely? The most recent polls have given Syriza a lead of two to ten percentage points over the centre-right New Democracy party, which is currently governing in a coalition with the (much reduced) centre-left Pasok. While the number of undecided voters is still very high (in the range of ten per cent), the pattern is very consistent: ND has not been leading in a single poll taken since last May. Being the strongest party is significant, as it would give Syriza the 50 seat bonus that is still enshrined in Greek electoral law. ote will be enough to give Syriza an outright majority of the seats (tactical voting, anyone?). Otherwise, they will have to find a coalition partner. The communists (KKE) have firmly ruled out the prospect of any cooperation with Syriza, while Tsipras has declared that he does not want to work with the left-liberal (?) Potami. As of now, other coalitions look even less likely, so this may well end in a hung parliament. With all that is going pear-shaped in the world, you would be forgiven not to be aware of the latest instalment in the Great Greek Political Drama Series. It actually had a rather long lead: The current president’s term was coming to an end, and Alexis Tsipras, the leader of the radical left opposition faction Syriza had made it clear from at least last summer that he would use the provisions of the constitution to bring down the current centre-right/centre left coalition government. How was that possible? After various defections, the current government is supported by 156 of 300 MPs, still a workable and reasonably stable majority of 52 per cent. But although the office is largely ceremonial, electing a new president requires a super majority: two thirds of the MPs in the first two rounds or 60 per cent (180 votes) in the third and final round. That alone is an unusual arrangement, as a surprisingly large number of European states does more or less well with unelected ceremonial heads of state (think monarchy), while many others are content to elect the chief figurehead by run-off or simple plurality rules. In Greece, parliament is dissolved instead (and to add insult to injury, a simple plurality is sufficient to elect a president in the new parliament). Given the current state of the polls, the most likely outcome of the election on January 25 is a hung parliament: the government will lose its majority, but Syriza will probably find itself without a coalition partner and will not be able to govern alone even if they win the bonus awarded to the biggest party. Moreover, the small “Democratic Left” party will probably be wiped out, and various independent MPs will lose their seats. 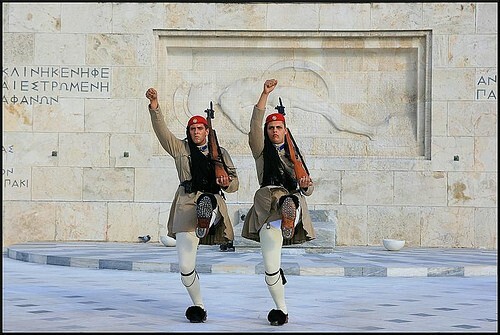 The right-wing “Independent Greeks” and the neo-fascist “Golden Dawn” are also poised to suffer (less dramatic) losses. On political grounds alone, the continuing until 2016 should have been preferable to an early election for any MP to the right of Syriza, not to mention the decline in personal circumstances for those who will lose their seats. The 25 independents acting in unison alone could have prevented the election. And yet, only 168 MPs voted for the government’s candidate, 13 more (or perhaps 15 more – this is confusing) than the government’s own voting bloc but 12 less than required to prevent the election. So the others either have privileged information about the outcome of the election, value principled opposition higher than political outcomes and personal welfare, have silently defected to Syriza, or have received some side-payment. Or they are irrational. Your choice. 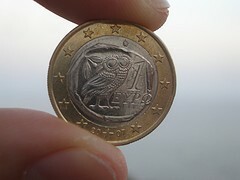 All over the world, the views about the Euro crisis are seemingly becoming more apocalyptic. Analysts say it is “five minutes to 12”; that Europe has only 3 months left to act. In Germany, the clocks seem to run in a different timing when taking measures to tackle the crisis is concerned. How come? Even 3 months might be an optimistic assessment, but actually nobody seems to know just how to put an end to this crisis. Over the last year or so, the German government has time and again agreed to (and sometimes proposed) measures that it considered unthinkable only months and weeks ago. Many times, Greece/the Euro/Europe were “saved”, only to find themselves in mortal danger the next week, so the public is growing tired. Yet, I think if the government had a clear strategy for solving the problem, it would act decisively. The pressures for Germany to act (specially for Merkel) are growing by the day. Do the expectations this time have a different nature? For a long time, observers in Germany and abroad were focused on yet more guarantees or loans. Only now citizens and politicians begin to realise that there is a political problem at the core of this crisis (i.e. a lack of integrated fiscal and redistributive policies in the Eurozone), but there is obviously no quick fix for this problem. To which extension Merkel’s position reflects her own personality? Merkel’s approach to policy making is pragmatic and incremental. She tends to act only if she has a clear understanding of the problem and if she is sure that she has enough political support. Are there internal political reasons for Merkel not to act like other countries expect her to? You bet. Merkel heads a coalition of three parties that disagree on many domestic issues. At the moment, it seems not likely that the coalition will win another term in the 2013 election. Saving Europe only adds to these woes. While her own CDU is staunchly pro-European, many of her MPs consider Germany’s responsibilities under the current bailout packages more than a little daunting. The CDU’s Christian-Democratic sister party CSU is a regional party whose main purpose is to protect Bavaria’s interest in Germany. They have a fair number of closet eurosceptics in their ranks. Finally, the liberal FDP has been teetering on the brink of self-destruction and electoral implosion for years now. They have faced a minor backbenchers’ rebellion over the bailout, and their leadership does not seem to believe that Greece can stay in the Eurozone. As far as the public is concerned, saving the Euro is not exactly a vote-getter. Germans were very reluctant to join the Euro in the first place. In real terms, their wages have stagnated over the last decade, and they have reluctantly accepted massive cuts in welfare programs. Over the last 22 years, the West-German majority has transferred a net sum of about one trillion Euros in East-Germany, and yet the Eastern states are lagging behind economically. A vast majority of the public is convinced that Greece cannot be kept within the Eurozone, and many believe that Greece is some sort of European welfare scrounger. The government has framed all previous bailouts as exceptional emergency measures and has made no attempts to prepare the public for any fundamental changes to the EU’s treaty base. Which political groups play an important role as on views to tackle the crisis in Europe? Does the struggle between Merkel and SPD to ratify the fiscal pact represent something unusual for the political scene in Germany? Where do their positions are different, fundamentally? The SPD’s support for the fiscal pact is a constitutional and political necessity. Regarding European affairs, there is normally a very broad consensus amongst the major German parties. The SPD backs the consolidation measures in principle but wants to ease the burden for the southern economies somewhat. They also believe that the EU should launch a stimulus program, and that the banks should contribute to the reconstruction of the Eurozone through a transaction tax. I’m sure that the SPD and the coalition will come to an agreement eventually.